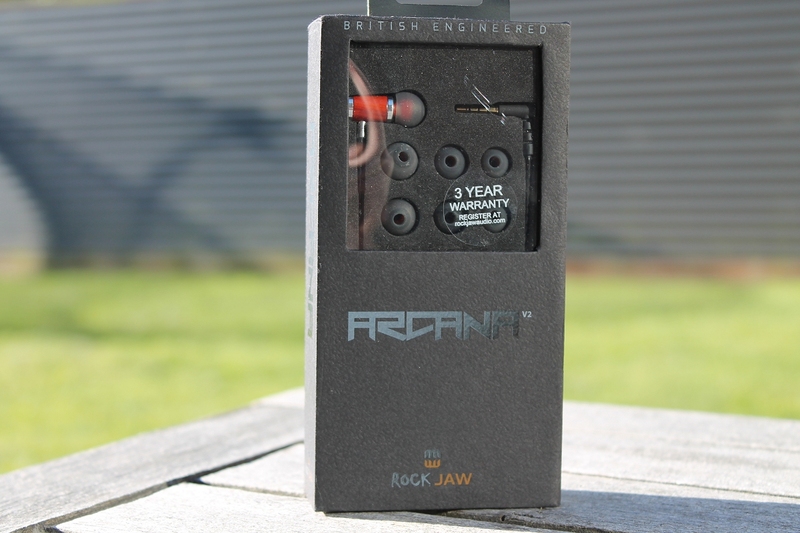 I’ve been working with RockJaw UK for the last 12 months giving feedback on their IEM line, and providing reviews as they get to release point. So it was with great pleasure that I received a courier pack from Bob containing not only the Arcana V2, but also the Kommand and Hydra V2. I posted a review on the Hydra a little earlier (not a big fan) and will be reviewing the Kommand in the near future. 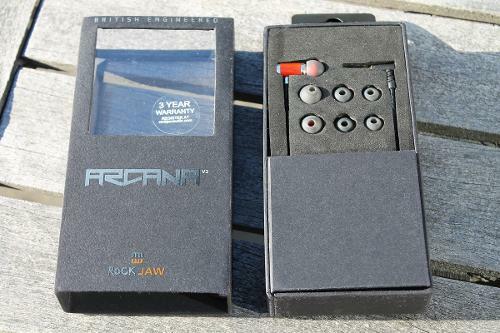 The original Arcana was supposed to be a dual driver IEM. I did get to sample the first version, and although the build was brilliant, I wasn’t overly enamoured with the sound, and after discussion with Bob, agreed not to review it as changes were in the wind. The new Arcana arrived just before Xmas, and the changes were readily apparent. The original body was gone, as was one of the drivers, and the new Arcana now looked more like the existing Alfa Genus – but more importantly, sounded infinitely better. 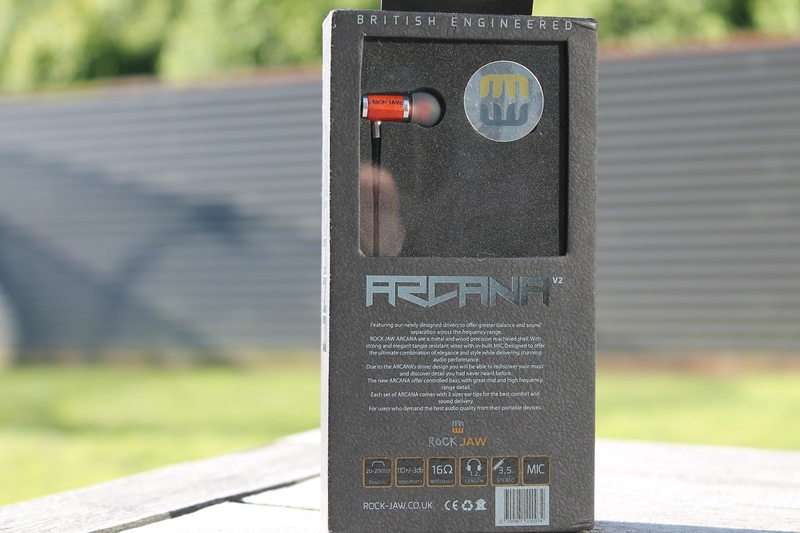 The Arcanas arrived almost 3 weeks ago, and unlike the Hydras, I’ve spent quite a bit of time with these in my ears – simply because they are a lovely sounding IEM. I’d estimate I have around 25-30 hours listening time with them so far. Read on to find out my personal thoughts on the Arcana 2 and who might find them to their tastes. I was provided the Arcana V2 as a review unit from RockJaw. I am in no way affiliated with RockJaw - and this review is my subjective opinion of the Arcana V2. I do want to take this opportunity to thank Bob – he exemplifies RockJaw’s excellence in customer care in every communication we have. For the purposes of this review - I used the RockJaw Arcana straight from the headphone-out socket of my iPhone 5S, X5, and X1. I also used my Beyer A200p and also the E11K amplifier, but IMO they do not benefit from additional amplification. In the time I have spent with the Arcana, I have noticed no change to the overall sonic presentation (break-in), but am aware that my impression of their sonic footprint may have changed over time with use (brain burn-in). The Arcana V2 arrived in RockJaws new retail packaging (essentially the same as the Hydra V2), and consists of a retail sleeve which is windowed front and back, and an inner compartment. 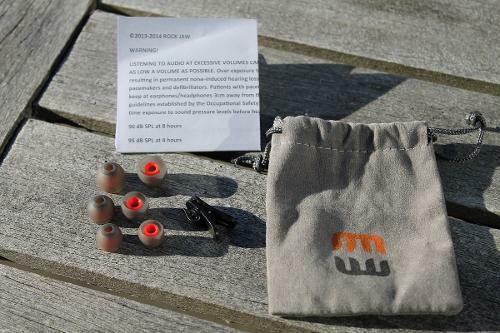 When the outer sleeve is removed, it reveals a foam insert holding the IEMs and tips, and hinged lower compartment containing shirt clip, manual, and carry pouch. 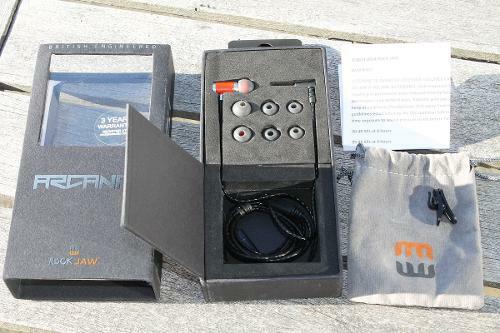 The packaging is solid, easy to handle, and IMO looks really nice (I personally love the slate, grey and orange combination). The included carry pouch is essentially a draw string felt type bag – but it appears well made and is ideal for carry the Arcanas in your pocket. It won’t offer a great deal of protection, but given the very good build quality, it should be sufficient and is appreciated as a great solution for avoiding cable disarray. At the time of writing, I do not have a frequency graph – but at a guess I would suggest a small bump in the bass, very slight recession in lower mids, and small bump in upper mids, and larger bump in lower treble. The Arcana V2 has a very lightweight aluminium top and bottom plate with a cherry wood enclosure around most of the body. 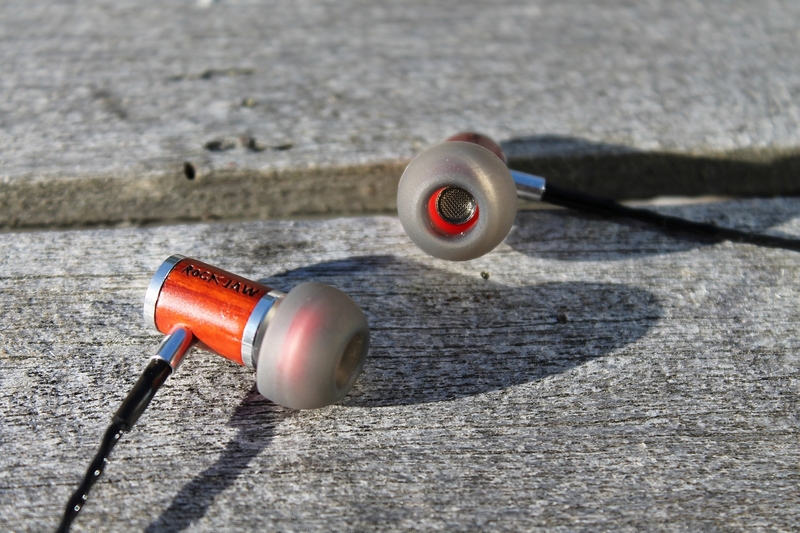 The IEM is a classic bullet cartridge type shape. It measures 9mm in diameter at the base, and has a length of 20mm from bass to nozzle tip. 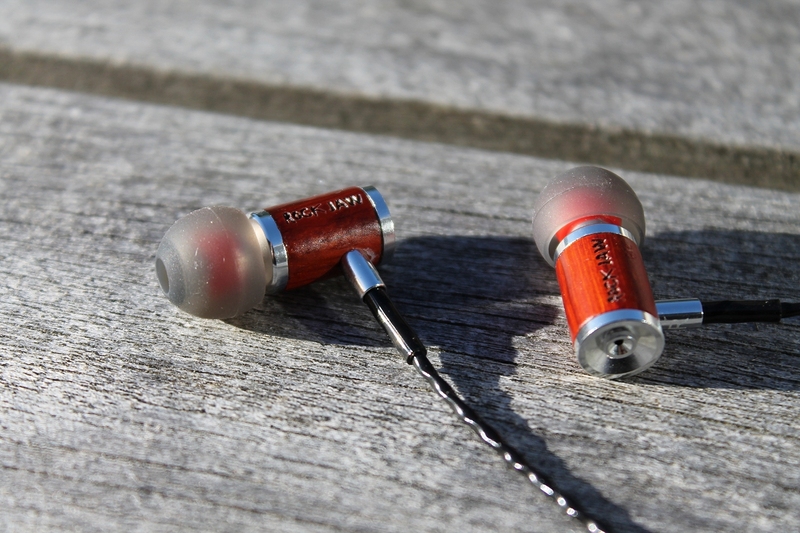 The colouring of the wood is much lighter than the wood used on the Alfa Genus, and clearly shows the grain. Bob tells me that it is a cherry wood, but actually has more of a rose wood colouring. RockJaw’s name is nicely engraved into the side of each shell. The aluminium upper and lower is very clean, and looks spectacular against the wood. 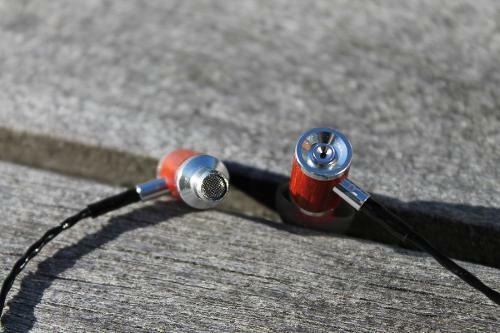 There is a very sturdy (better than the Alfa Genus) aluminium exit for the cable, and this in term has good strain relief. The L/R markings are in white type on the silver, and hard to read – but this doesn’t matter as the left earpiece is the only one to have the mic/button control. There is a large vent/port at the rear of the Arcana, the nozzle has a generous lip, and is also meshed to protect the driver. One of the things I love about RockJaw’s nozzles is that they are slightly tapered at the front – which means it is a little easier to get tips in place. 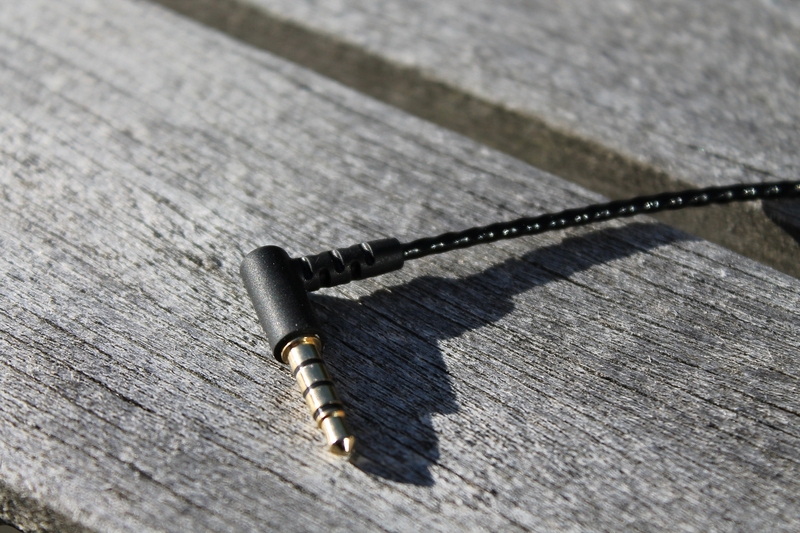 The cable is brilliant, and again I wish more manufacturers would adopt something similar. 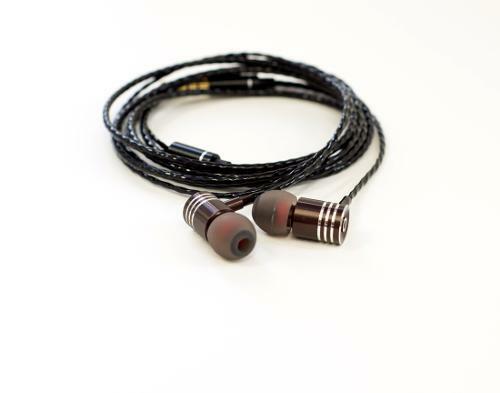 It is a twisted pair encased in a smooth flexible plastic sheath which is very pliable, very non-microphonic, and appears to be very strong. 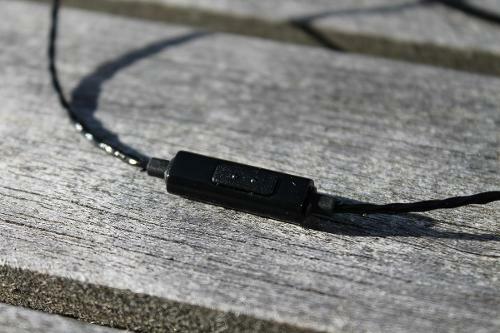 From the left earpiece there is a combined mic and single button control device (1 click pause/play, 2 fast clicks track +1, 3 fast clicks, track -1). This hangs (when worn over ear) about half-way between my jaw and shirt collar. The microphone is a good for audio and in my testing voice came through loud and clear. 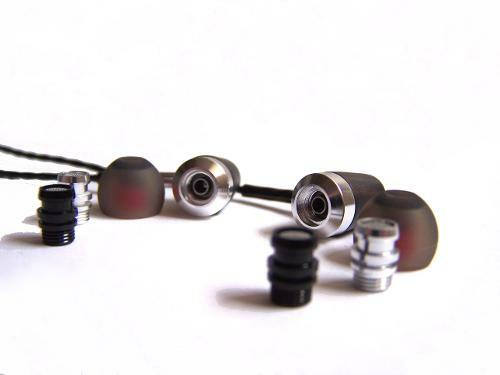 For those preferring a chin slider/cinch, the mic unit is the reason it is missing – but a shirt clip is included instead. Small note here – the button control works well with my iP5S, but surprisingly also with my Fiio X1 (although it was occasionally flaky with the X1). Overall the build quality is a good standard for the cost. I can’t really fault them at all. I have one ear canal slightly different to the other one (my right is very slightly smaller) - so I tend to find that usually single silicon flanges don't fit overly well. I initially tried the included large silicone tips, and whilst they fit OK, I was unable to maintain a seal. So I reverted to a slightly wider set of single flange silicone tips of my own which also have a very wide bore. I could also try Comply tips – but the ones I’m using now worked so well with the Hydra, they are a natural fit for the Arcanas as well. 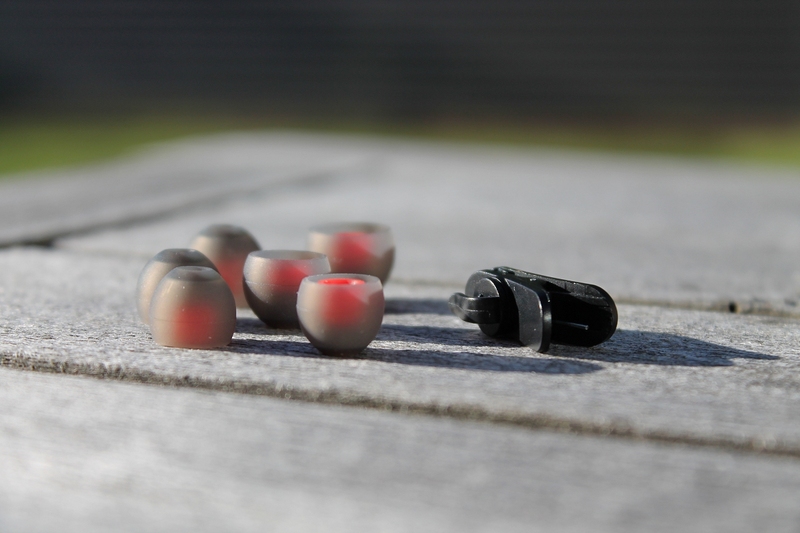 Comfort is very good and they are very light weight, easy to fit (once you have the right tips), and also fit quite flat to my ears – so can be worn lying on my side. 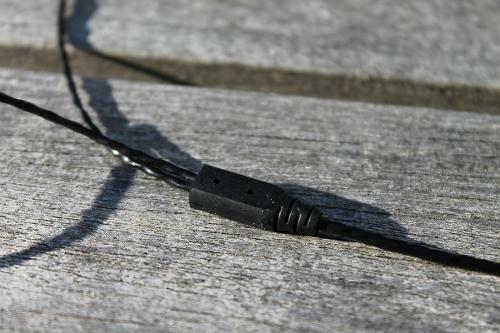 The Arcana can be worn cable over ear or cable down. 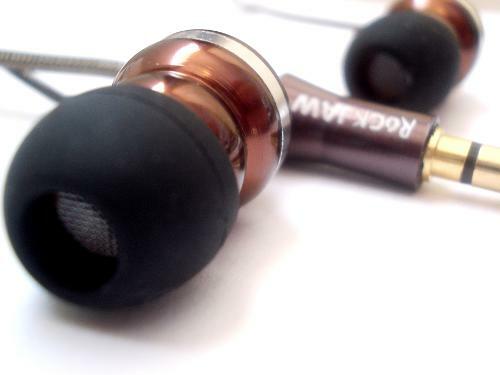 Isolation with a good insertion and correct seal is average for an IEM, mainly due to the rear exterior port. With music playing, most ambient noise is well and truly filtered out. Again (like the Hydra previously), I’m not sure if these would be my choice for a long haul flight though. So how does the Arcana V2 sound? The following is what I hear from the Arcana V2. YMMV – and probably will – as my tastes are likely different to yours (read the preamble I gave earlier for a baseline). Most of the testing at this point was done with my Fiio X5 as source, no EQ, and silicone tips with a wide bore. If I was to describe the default signature in a few words – I’d choose the words “clear”, “punchy” and “fun”. The Arcana V2 has a great signature which mixes clarity in the mid-range with energetic bass and a nice crisp top end. The resultant combination is a very lively forward overall presentation which has plenty of detail, and is very engaging. First up was Gaucho, and joy of joys all the detail is there, and it is brilliant and vivid. The sax intro is forward and everything just gels together nicely. Vocals are clear and lively. Bass matches nicely on this track – the bass guitar is perfectly balanced. I love this presentation! Plenty of contrast – and I really don’t think there is anything I would change. Moving onto “Sultans of Swing”, and once more the overall balance of the Arcana is just stunning. 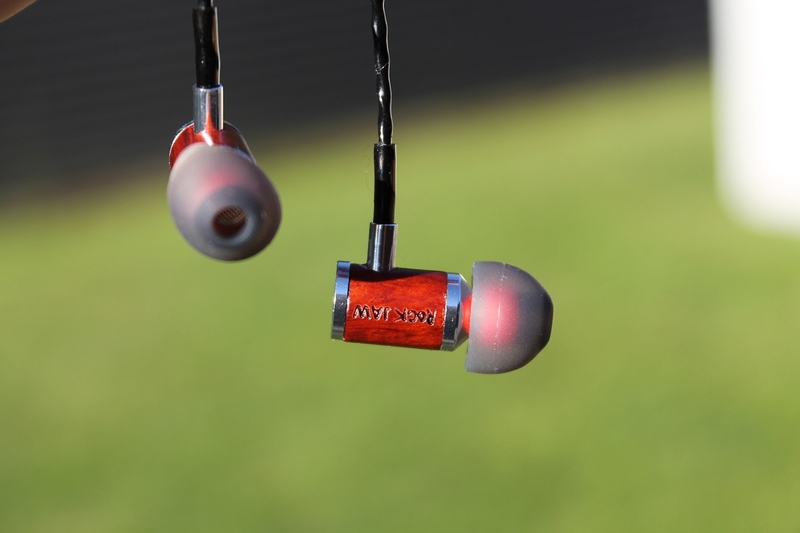 The bass is fast, but sounds natural – just enough to compliment rather than overpower. Vocals are crystal clear – and more importantly sound natural. Knopfler’s guitar contrasts nicely with his vocals, and the overall coherency of the track is wonderful. Detail is definitely there – the subtle hits of snare and cymbal – and while it may not be quite as vivid as some of my more detailed IEMs, the overall combination of detail and tone (for my tastes) just resonates. Separation of instruments is excellent, and there is no evidence of smearing on any track I’ve listened to so far. It’s usually difficult to get a reasonable stage size from an inner ear monitor. The stage is often quite small / close – with an average impression of space. The Arcana has an average stage for an IEM, and with this track extends just out of head (not by a large margin though). There are good directional cues, and both width and depth are represented well. Next up was Loreena McKennitt’s “Dante’s Prayer” and the opening piano notes almost took my breath away – a beautifully natural rendition of tone and timbre. Whilst the sense of space is more intimate than spacious, it still delivers very good imaging within the intimate stage it sets. Loreena’s vocal delivery is compelling – I’m definitely sitting very close to the stage – but my goodness it is captivating. In this track, the applause at the end is so well presented that with some headphones (HD600) I can actually close my eyes and imagine myself in the crowd. With the Arcana, the applause is slightly behind me, but it feels real, and I am very impressed. As you’ll guess from my earlier comments, the Arcana has bass that is quite forward and a little north of neutral. What I like about it so far is that it is quick, agile, and only there when needed. It can be a little loose in the mid-bass with bassier tracks (longer decay). When the bass is present in a track though, the Arcana can go impressively low, and it has stellar impact. Amongst my test tracks is “Muddy Waters” by Mark Lanegan. This blues rock track is quite dark and brooding anyway – and is often a good test of bass bleed. The Arcana dutifully pumped out a thumpingly mournful back-beat (the way it should be), but didn’t impact on Mark’s vocals (which had great timbre and plenty of the “gravel” he’s well known for). The bass delivery is copious but it is controlled, and it really is lively and fun. To get a further idea of quality this time, I next played Zoe Keating’s “Escape Artist”. The Arcana’s rendition of Zoe’s cello was a little more forward than I’m used to, but it was really captivating. One thing I’m noticing with the Arcana is that it isn’t a relaxing IEM – it is very vivid, very alive, very compelling. This was always going to be an interesting test for the Arcana because whilst they have a small upper mid-range bump, I wasn’t sure if it was going to be enough to cope with artists like Agnes Obel (some of her recordings can become quite strident or shouty if the mids aren’t quite right). I needn’t have worried – the Arcana delivered very well. Not as euphonic or sweet as my A83 or Altone200, but very enjoyable. The cello in the background also featured well – with good timbre and tone, although probably a little more forward than I normally hear from my hybrids. I then proceeded to play my normal medley of other tracks from artists including Christina Perri, Gabriella Cilmi, Florence and the Machine, Feist, and Norah Jones. It would be hard to pick a stand-out as the Arcana really did well with all of my tracks. FATM and Feist’s tracks were unbelievably dynamic – with the bass thumping viscerally, but the vocals nicely layered, forward and vivid. Perri’s “Human” was stunningly clear, and soared majestically in the chorus. Cilmi’s “Safer” was tonally beautiful, and delivered with emotion. In each case the delivery is ever so slightly warmer than what I am used to – but it is very, very enjoyable. The Arcana was incredibly energetic with everything I queued. Very clean and clear in vocal presentation, and able to nicely portray the crunch and edge of lead guitar. At times the bass might have been a little thick and loose – but it doesn’t matter when the rest of the track gels so nicely. I went through my usual track list and probably the only track I had minor problems with was Diary of Jane, where there was a bit of congestion, but this can be a brutal track for overloading a driver, and the smearing was actually pretty minimal. Everything else was dynamic, fun, but also clear, and articulate. Time for what has become my litmus test with male vocals – Pearl Jam. Like the majority of tracks I’ve already listened to, the Arcana just takes it all in its stride. Vedder’s voice conveys the emotion of the track easily. Cymbal hits are clear, the background bass guitar is there but not overpowering anything. A winner in my book. My reviews have tended to get a bit long winded recently so I’m going to try and condense this section to very short summaries. Rock – already covered with the Male Vocal section above. The Arcana does rock well. Hotel California was a standout – tonally beautiful. Alt Rock – really good. Both Floyd and Porcupine Tree. My personal preference for “Trains” might have been for a little bit more brightness, but the bass impact was stunning. Jazz / Blues – Portico Quartet was a joy to listen to – brilliant separation and detail. Very good contrast between the double bass and cymbals. Likewise Bonamassa’s guitar and vocals shone with the Arcana – the right amount of edge, the right timbre – very active and engaging. Rap / EDM – Absolutely shines with these genres. The clarity of the vocals along with the impact of the bass is compelling and captivating. Little dragon could get a little boomy at time – but The Flashbulb was another absolute standout. Pop / Indie – Very good with mainstream artists like Coldplay. Stunning bass impact with Lorde (reaches really low). One of the highlights (on the Indie) front was the portrayal of Wildlight and Band of Horses. For my tastes the Arcana does Indie incredibly well. 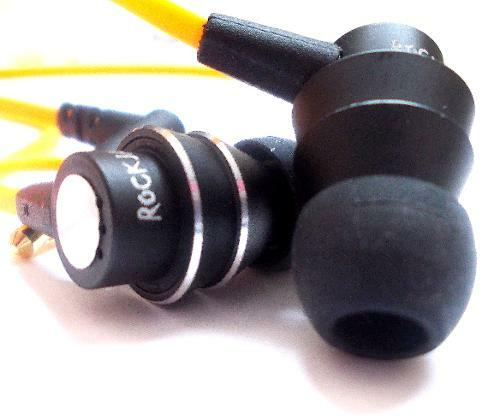 There is something about its mid-range – euphonic but detailed. Captivating. Classical / Opera – Not really surprising, but the Arcana took this in its stride as well. Netrebko and Garanca was very good – probably the first time I’d heard the Arcana sounding slightly less energetic (more relaxed), and Kempff’s piano solos were great on timbre, and really did convey some of the emotion he brings to Beethovens piano sonatas. I covered this in the introduction – but to me the Arcana definitely don’t need any extra amplification. 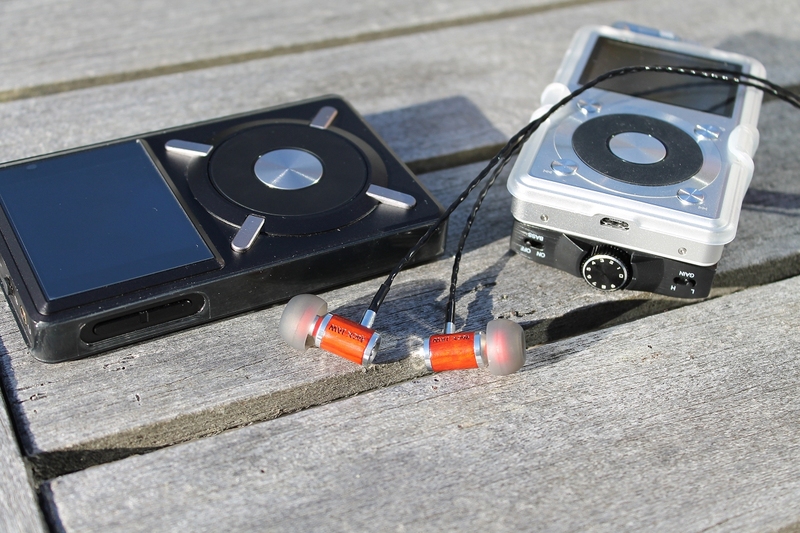 They were easily powered out of all my portable devices, and with the X5 I rarely go above 30/120 in terms of volume. I did volume match and compare the X1 and X1+E11K, and apart from a slight change in tonality (minimal) there was no real change in dynamics to these ears. It was an absolute joy to switch from my review of the Hydra to the Arcana. As Bob suggested when we first talked about the retuning, the Arcana was one he was really happy with the sonics, and he was pretty sure I’d enjoy it. Summing up from top to bottom, the Arcana has a very solid build and aesthetically looks gorgeous (love that wood). It has a very good cable, fits nicely, and is both light weight and looks to be very durable in the long term. Sonically its not quite to my personal tastes, but for a bassy earphone, it is a lot of fun. It is pretty energetic, displaying an impressive upper mid-range, good treble sparkle, and bass that is relatively quick but quite a bit above neutra (especially the sub-bass). With the extra bass comes a little bloom on the occasional track – but no real bass bleed. 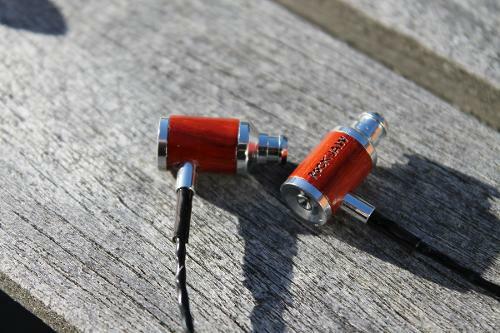 As a whole, the Arcana is vivid, a lot warmer than my usual IEMs, and a lot of fun. The RockJaw Arcana V2 is an all-rounder and at a price around 40 pound or 60-65 USD I would recommend it without any reservation. I would certainly have no hesitation recommending the Arcana to both friends and family. No recommendations for change from me. At this price point, don’t change a thing. djvkool and H20Fidelity like this. 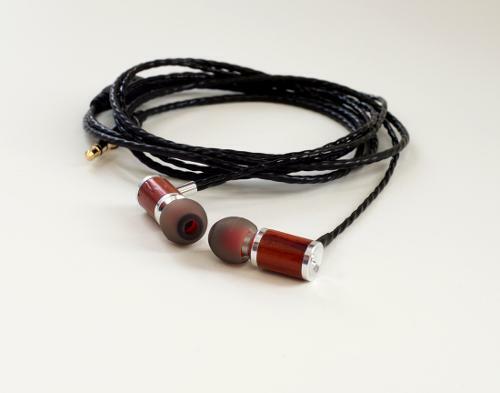 Another excellent review from one of HeadFi's most reliably accurate reviewers (IMO). Look fwd to the Kommand assessment as (those unnecessary ear hooks aside) I'm expecting good things. Thank you gentlemen. The feedback means a lot to me and is appreciated. 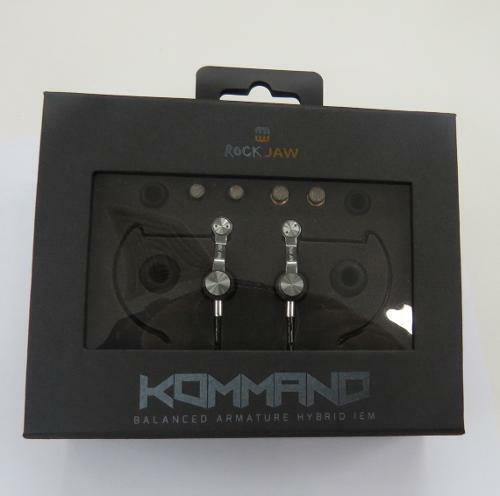 The Kommand review is up - and also included in @mark2410 's thread (http://www.head-fi.org/t/752136/rockjaw-kommand-review-impressions-thread). Interestingly we posted within a couple of hours of each other - and our findings were very similar. Another great review Brooko, you do indeed give other reviewers something to shoot for. Pros - Wow! Stunning, jaw dropping detail for the money. Madly exuberant. Cons - It really isn’t one to sit still and chill. Price: £40 or about US$63 but I couldn’t actually find in the US yet. Build Quality: Lovely. Seem well put together and the braided the cover cable I always like. Isolation: Rather good for a dynamic. Not quite up to a daily Tube commute but would do fine for most people in most environments. Naturally easily enough to get yourself run over if you aren’t paying attention. Comfort/Fit: Great. Worn up or down, was a stick in ears and I was done. Little bit of air pressure but nothing to be concerned about. Aesthetics: I really like them visually. Personally I’d like a more grown up font used on them but its tiny anyway. The wood and silver finish rather appeals to me. Much pretty. Sound: Wow. Intensely exuberant and vigorously dynamic. It’s got a really W shaped sound and it just wants to run perpetually wild. It does a have a bit of a slant to the bass so expect abundance. I’ll confess it got tiring for my ears but Christ, this thing is good. The detail levels are fantastic everywhere and my god, it’s all just so explicitly forward everywhere. It’s not something I’d ever find myself relaxing to, it’s all just so incredibly engaging and wild. Even taking it side by side with the Telefunken TH-120 the ArcanaV2 still out energises it, then it goes on the actually out detail the GR06. The 6 has been long standing as the “best” of this sort of price and while it’s still probably the more generalist, the Arcana V2 really gives it’s a thorough kicking. Sure it won’t be loved by all as it’s just too dynamic and attention seeking. It demands you pay it attention when they are playing so you will never sit back and relax with them. Is that really a big flaw? Their wild nature being too engaging for use every single day is as close am I getting to there being a problem with the Arcana V2. Yes it’s pretty bloody awesome. Just remember, this does not want to lend itself to mellow so it’s not the ideal generalist for eclectic musical tastes. It’s not for “chillin’” it is there to engage you and captivate you whether you’re in the mood for that or not. Value: Just buy a pair and a I dare you think they’re not awesome. Pro’s: Wow! Stunning, jaw dropping detail for the money. Madly exuberant. Con’s: It really isn’t one to sit still and chill.